Home » speech » Yoga and Kids: What Are The Benefits? You might have wondered why your first grader is coming home and saying that the class did yoga during gym. 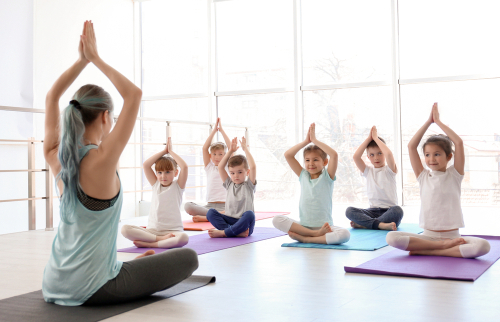 Yoga is becoming more common in school and in after-school programs, and there is good reason. A growing body of research has already shown that yoga can improve focus, memory, self-esteem, academic performance, and classroom behavior. It can also reduce anxiety and stress in children. Today’s kids live in a bustling world of busy parents, challenging academics, video games, competitive sports and stress. Children often encounter emotional, social and physical conflicts, and yoga instructs them on breathing techniques, behavioral guidelines and postures. Play and focus are part of yoga, and there is no pressure about being wrong. It’s good for the children who might shy away from physical or group activities for fear of failure, and it helps the more athletic children excel in other activities and sports. There are many benefits to children doing yoga. It promotes physical strength and flexibility by challenging various muscle groups. Yoga also helps to improve balance, coordination and overall dexterity. It develops focus and concentration and encourages children to clear their minds and focus on effort. Studies have even shown that yoga helps young students even obtain better grades. It boosts self-esteem and confidence by teaching them to persevere, be patient and work towards their goals. Lastly, it helps to alleviate certain social pressures and calm children so that they behave with mindfulness, compassion and overall happiness. Yoga is beneficial to children of all ages, but it has been found to be particularly so for kids with special needs. Studies have shown that yoga benefits children with autism and ADHD. NPR reported that researchers surveyed teachers at a Bronx public school that had a daily yoga program and found that the program reduced kids’ aggressive behavior, social withdrawal, and hyperactivity, compared with a control group of kids with autism who did not practice yoga. In summary, yoga is about exploring and learning in a fun, safe and playful way. It teaches us about our bodies, how to breathe better, how to use feel more relaxed, focused and motivated and how to listen with attention and make good decisions. It promotes balance and teaches us about taking care of ourselves. Yoga is a great way to move our bodies, feel healthy, stay focused and relaxed and show compassion for others.